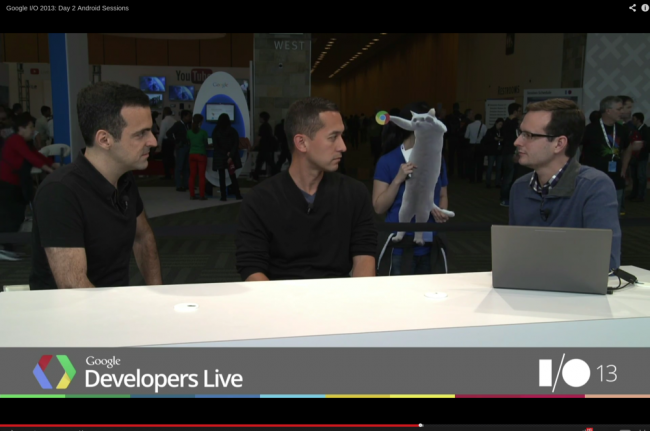 Hugo Barra and Hiroshi Lockheimer sat down this afternoon with Reto Meier to talk a bit about the Android-related happenings around Google I/O this week. They didn’t reveal anything new, like the release date for Android 4.3, but when they were asked what their all-time sentimental pick for favorite device was, we couldn’t help but smile at Hugo’s answer. Hiroshi went with the G1, but Hugo picked a phone straight out of our past – the “OG” Motorola DROID. He even dropped a little “DROOOOOID” after mentioning it. His pick was the DROID because of that was the time we got turn-by-turn navigation, voice search, and “all those cool things,” that helped push the platform in a big way. We couldn’t agree more, Hugo.